Do you long to be calmer and more centered? Do you carry the strain of the world in your neck, shoulders, and back? Could you use a generous helping of self-care? 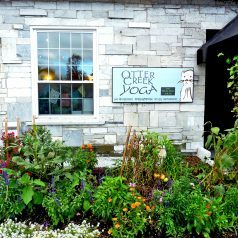 Consider checking out our February Co-op Connection Business of the Month – Otter Creek Yoga! Let them know that you’re a Co-op member-owner and your first class is free! Wouldn’t that be a lovely Valentine gift to give yourself? For 10 years, Otter Creek Yoga has offered our community an oasis of calm and healing – a place to come home to your true self. Their beautiful, peaceful, sunny studio is located in Middlebury’s historic Marbleworks and offers daytime, evening, and weekend classes for all ages and all levels of experience. Click here for the schedule and click here for detailed descriptions of the classes offered. For 10 years, Otter Creek Yoga has offered our community an oasis of calm and healing – a place to come home to your true self. Their beautiful, peaceful, sunny studio is located in Middlebury’s historic Marbleworks and offers daytime, evening, and weekend classes for all ages and all levels of experience. Click here for detailed descriptions of the classes offered.